Swimming lessons are available 4 times a week, taught byhighly trained certified lifeguards. Westpark follows the Red Cross program. it include Moms & Tots(Parented), levels 1-10 and Pool Rats. Bronze Medallion and Bronze Cross are also available at thepool. These courses are the steppingstone in becoming Lifeguards. The Courses are FREE of charge for members,however fees will apply for the final examination and material, payable to the Canadian Lifesaving Society. 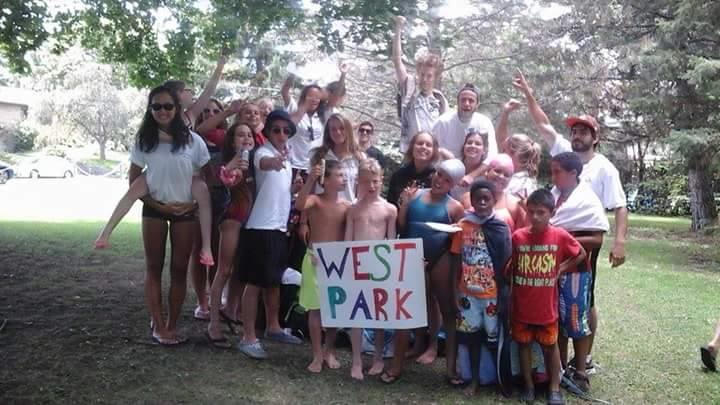 Westpark Pool competes in numerous meets with other poolswho are part of the North Shore Aquatics association. Children of all ages can join the team. Coaches actively work with swimmers, makingswim team a fun and rewarding experience. There is a total of 5 swim meets during the season along with 2 excitingfinal championship meets. Available for kids ages 12 and under, 14 and under, and 16and under open teams. Our water polo crew will teach your child the fundamentals and techniques of waterpolo. Numerous competitions are held throughout the summer, hosted at WestparkPool and other North Shore Aquatics Association pools situation in the WestIsland. A total of 5 matches are held throughout the summer 2 playoff andchampionship matches at the end of the season. A favorite among girls of all ages, our dedicated staff ofsynchro coaches will teach your child the physical beauty of synchronizedswimming. Considered to be a form ofwater ballet, team members will have the chance to compete in competitions,held at various pools on the West Island. Entries will be accepted for solo and team events. Two competitions are held each year. Soar through the air and join our diving team. Available for children of all ages, multipleteams are available to join, catering tomultiple levels from beginners to advanced. Meets are held at Westpark Pool andother North Shore Aquatics Association pools. A total of 5 meets are held each year along with 2 final championshipmeets. Being board all summer is terrible. For kids 12 and up, thisprogram offers kids to help out around the pool during lessons, duringcompetitions, fun days and other activities at the pool. In return, these kidswill participate in weekly activates and outings like movies, scavenger hunt,water park, sleepover, etc. Want to get a full body workout in a fun and positive way?Super popular among its senior members, it is designed to provide a total bodyworkout by giving a balance of a cardiovascular as well as a muscular strengthand endurance exercise.